What African animals to look out for and where to find them. Amongst South African Wildlife the Big Five tops the glamor stakes. These animals built their reputation on being the most dangerous animals when being shot at and the most likely to retaliate. These five animals are however not the five biggest or the five rarest, or even the five most interesting. There is however plenty other wildlife species that are even more worthwhile to track down. South African wildlife can be viewed within a huge collection of wildlife regions and game parks - both public and private. South Africa is edged by every possible landscape - from deserts to forests - from high mountain ranges to narrow coastal belts - all teeming with abundant wildlife. 13 are near-threatened (conservation status as assessed by the IUCN). The most abundant wildlife areas in South Africa are in the provinces of Mpumalanga, Limpopo and Kwazulu-Natal. The premier South African safari game viewing destinations are the provinces of Mpumalanga and Limpopo, which is located in the north east of the country. Here you will find the South African flagship park the Kruger National Park, with more mammal and bird species than any other. No fewer than 147 South African wildlife species occur in this park - over 65 per cent of the mammal species occurring in South Africa. This is predominantly because of the size of the area concerned. At nearly two million hectares, this vast area encompasses a variety of different eco zones and spreads across two climatic regions. Big five sightings are frequent with good chances of seeing Cheetahs, African Wild dogs, Roan antelope, Sables and Nyalas. The guided night drives are excellent for chances of seeing Big Cats hunting. On the borders of this park you will find a number of smaller national parks and lots of private game reserves and luxury lodges. The best game viewing opportunities in KwaZulu-Natal is in the Hluhluwe-Umfolozi Game Reserve which is 250 km northeast of Durban. This is the largest big game reserve in this province and is rightly called the Rhino capital of Africa. This reserve was set aside with the specific purpose of protecting the tiny population of White Rhinos. This action saved the species from certain extinction. Relatively new additions to reserve is the African Wild dog and optimal for spotting Elephants and Buffalos. Guided night drives provide excellent opportunity to see Lions, Leopards and Spotted Hyenas. Also in KwaZulu Natal is one of the most important South African wetlands. Although the game is less concentrated, the Isamangaliso Wetland Park offers a wide range of animals with abundant Hippos, Nile crocodiles and numerous wetland birds in the estuary. 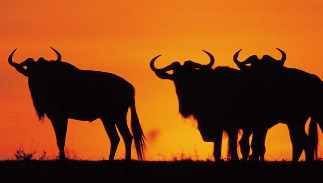 Frequent sightings of Nyalas and Warthogs are reported. It should be noted that there is a malaria risk in the KZN parks so precautions are necessary. In the North West Province you have Pilanesberg National Park, which is approximately 110 km northwest of Pretoria. This national park has huge South African wildlife diversity. This includes over 20 species of ungulates, chances to see African Wild dogs, Cheetahs and frequent sightings of Brown Hyenas. Big five are readily seen though Buffalo found only in more remote areas of the park. Generally speaking, the Western Cape, Eastern Cape and Northern Cape do not offer the same wildlife diversity in game viewing as KZN, Limpopo or Mpumalanga. However, there are some fabulous untouched areas in the Karoo, Kalahari and Cederberg that host some game reserves and make for a good South African safari experience. You probably need to adapt your expectations to see South African Wildlife and enjoy the fabulous scenery. Animal sightings are less frequent, but sometimes more interesting. These areas have the added advantage of being completely malaria-free. The Eastern Cape has a number of excellent private game reserves and the fabulous Greater Addo Elephant National Park, which is located 72 km northeast of Port Elizabeth. As its name suggests, Elephants are the greatest attraction of this park. The close up viewing of these animals are enhanced because the park is largely devoid of tall trees. Black Rhinos and Buffalo do occur but are notoriously shy. Common sightings of Burchells Zebra, Red Hartebeest and Black Rhino. The Mountain Zebra National Park, near Cradock, is located 280 km north of Port Elizabeth. This is the best reserve if you want to spot Cape Mountain Zebras. Also excellent if you want to see Red Hartebeest, Springbok and Black wildebeest. Here you can admire some wonderful Karoo scenery. This is not classic game South African wildlife viewing terrain but it does make for easy animal spotting as the animals congregate on the grassy plateaus. The Karoo National Park, near Beaufort West in the Western Cape, is a great place to see Black Rhino. This is also a good place for watching Klipspringers. Common sightings of Black and Red Wildebeest. Keep your eyes peeled for Buffalos and Black Rhinos that are present but more rare. The Northern Cape has some fabulous game viewing, most notably in the Kgalagadi Trans-frontier Park, which straddles the border with Botswana. Here Lions, Spotted Hyenas and Brown Hyenas can be readily sighted. The Auob riverbed is excellent to spot cheetahs. This is also a place where viewing of African Wildcats and various other small carnivores are exceptionally good. In this region you will also find the Augrabies Falls National Park with a location 130 km west of Upington. This is primarily a scenic park also has some interesting South African wildlife like the tame Klipspringers. Frequent sightings of Giraffes, Eland and Springbok. Leopards are present but are more difficult to spot.